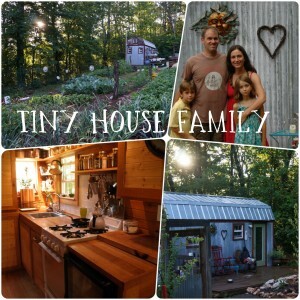 This whole tiny house journey started as part of a much bigger plan. 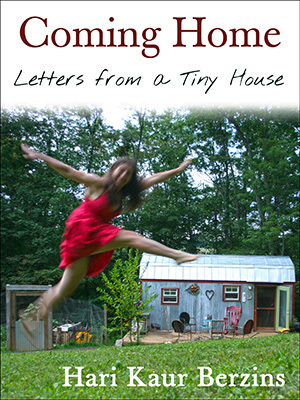 We wanted to live as free as we could from the confines of mortgage and corporate food. As we’ve lived on our land, we’ve been growing a homestead. Slowly, our virgin garden is showing signs of fertility–earthworms wiggle out as I am transplanting the seedlings, the shovel sinks in with little effort, there are less and less rocks to remove. Oh joy! You might laugh at me, but I stopped everything and took pictures the first time I saw earthworms in the garden. This brings me to cardboard. I’ve recently fallen in love with this free and plentiful resource for use in gardening and landscaping. Last year, I injured my fingers yanking at weeds all summer. My pathways and then my beds exploded with weeds. It got so bad, and my fingers hurt so much, that I stopped pulling them altogether. This year, I decided to put major effort into a new (to me) approach that was working in my friends’ gardens–sheet mulch, a popular permaculture gardening technique. It’s so easy and effective, I wish I’d thought of it a long time ago. Lay cardboard on the pathway. Remove all tape from the cardboard. Weigh it down with rocks. If you are going to immediately cover it with mulch, then skip this step. Cover cardboard with four or more inches of mulch. I’ve used free wood chips from Asplundh, a company that clears trees from the power lines. They dump the chips and allow the community to load it up for free. Check your local recycling center or landfill to see about free mulch. I also use leaves which decompose into a lovely black layer. The cardboard breaks down and becomes easy to puncture, so you can poke holes to insert plants where ever you want. My plan is to let the pathways breakdown and then incorporate that matter into the beds. There are more steps to this process, if you want to create a bed right off. I’ll get to those as time goes on. Earthworms started showing up last year, and this year they are so plentiful that one crawled into my sandal when I was working out there yesterday. Freaky, but exciting! The soil under the sheet mulch is amazingly fluffy–those earthworms have been busy. The garden is retaining more moisture. Since the paths are covered in such thick mulch, the moisture is also staying in the beds. There are no weeds in my pathways. 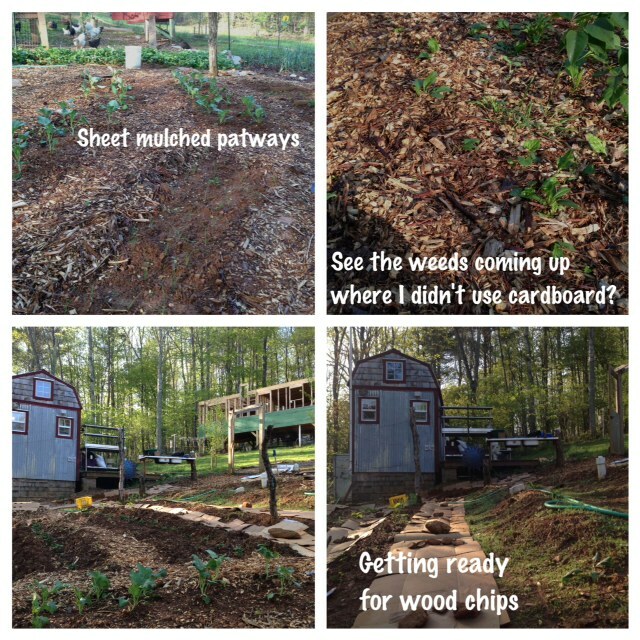 Places where I spread wood chips without first laying down cardboard are already growing weeds–so the cardboard is a very effective weed barrier. Here’s to free and effective renewable resources! Cardboard, I love you. I use sheet mulching all the time. After I get the cardboard in place I water it down well with the hose so that the edges lay close to the ground. Then I add the free mulch. Yea! Beautiful paths. I also use cardboard under my new garden beds. Cardboard, water, soil, compost, and leaf mulch. If I have poopy chicken straw, I add it under the cardboard to encourage the earthworms. Happy gardening! I enjoy your blog! Oh yeah… Costco has great flat cardboards for sheet mulching. Whenever I have a project in the garden, I make a run to that store to get cardboard. My daughter and I make a game out of who can find the most pieces. Love this idea. Thank you for posting. Can’t wait to try it in our garden this year.